Renowned lunar scientist Paul Spudis, recipient of the NASA Distinguished Public Service Medal and the 2011 NSS Space Pioneer Award, makes his case for utilizing the Moon’s resources to expand our cislunar and interplanetary travel capabilities. In this book, he makes a strong argument for a “Moon first” approach—not for mere exploration, but for a step-by-step infrastructure buildup to mine water from the Moon’s poles. The nearness of our neighbor would allow robots controlled from Earth to perform the preliminary work on a water mining plant. This water could then supply in-space fuel depots that would greatly enhance our ability to travel throughout the Solar System. NSS members will find he presents a cogent plan for expanding our ability to live and work in space, and will question why we have not yet implemented some of these ideas. 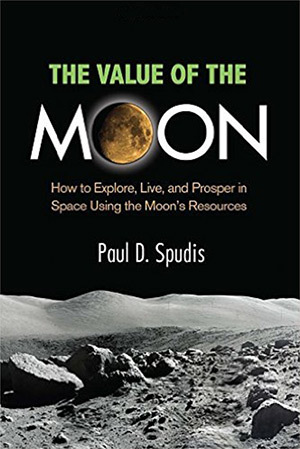 Spudis spends some time on the 2004 Vision for Space Exploration (VSE), which stated a clear goal of returning to the Moon to learn how to make useful products with an eventual Mars expedition. He explains how this changed over time to making the Moon a strictly “touch-and-go” destination on the way to Mars. Readers learn the details of his participation in various committees and workshops studying Moon return options, and his shock at the “spreadsheet of death.” This list, in his opinion, of six themes and 186 entries for input to the Lunar Architecture Team, helped diffuse all efforts away from a Moon resource processing outpost and into a nebulous exploration mission. 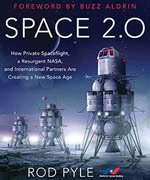 He concludes by stating that our current direction still does little to expand our space transportation infrastructure. In the second half, Spudis describes his sustainable architecture for becoming truly spacefaring. Here we learn his mantra for going to the Moon: “it’s close, it’s interesting, and it’s useful.” He posits five phases to his approach, each of which has a clear goal that must be met before implementing the next one. These phases entail water prospecting with a robotic heavy lander directly controlled from Earth and then resource mining, processing and production via heating of the soil. Subsequently, we would set up power stations and use microwave sintering of regolith to fuse its imbedded glass to make roads and landing pads. As water production grows, we would supply this as fuel for local missions and a cislunar depot. And when 150 tons of water per year is generated, we would be ready for his final phases of temporary and then permanent human return to the Moon. The accompanying table details 31 steps with their costs, which are in line with typical “exploration system” budgets: $7 billion per year (in 2011 constant dollars) over 16 years. The final chapters tended to be repetetive but provide some additional ideas, like using lunar materials to build solar arrays for Earth-based solar power satellites. 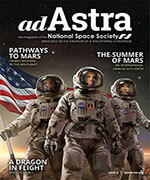 And although I agreed with Spudis’ conclusions that we should not simply “repeat” going to the Moon and must build a better space transportation infrastructure, I was a bit put off by some of his biting remarks over the current implausibility of Mars missions and the “Mars in my lifetime” mentality. Nevertheless, NSS members will find a coherent list of near-term lunar objectives against which progress can be demonstrated and measured towards expanding our spaceflight capabilities, and will find a good case presented that the Moon’s poles should be our next, logical stepping stone in space. For those wishing to expand their knowledge about our nearest neighbor, the appendix provides an extensive list of books, online resources, films and videos for a lunar library.